They came from different places, and even different worlds, but they all had one goal: to help guide humanity into that bright and shining future that is always just over the horizon. It had been two years since the superhero team known as the Guardians of the Dawn were validated and vindicated in a flash of light and the saving of thousands of lives long since lost. And while their popularity has soared to new heights, not all is right with the group. Note: The series takes place following the events seen in the “Guardians of the Dawn 2012 Special”. Summary: Professor Bart Wallace had gotten used to living a normal life in Paragon City when he is approached by a hero that he thought was also retired. Ryder Lightning is needed once again. But is Bart willing or even able to return to that life? And he’s not the only one coming back. The balance of power shifts in Paragon City in ways you will not expect! Summary: Ryder Lightning is back, but he learns that this is not the same Guardians of the Dawn supergroup that he remembered. A lot has changed, and not all of it for the better. Summary: What happened to MidKnight X? What is causing him to attack Ryder Lightning? And if Ryder is not powerful enough to defend himself, who is able to help? And can they reach him in time? Plus, will Lexie Lothora take up Lord Lee Geddy’s offer? And what did happen to Lord Geddy’s assistant? And finally, what caused Icon Powers to leave the Guardians of the Dawn? And if Ryder survives the attack by MidKnight X, would he be willing to take Icon’s previous position in the group? Answers will be revealed in the conclusion of this three-part mini-series as we set the stage for the next phase of the stories in the City of Heroes. Summary: The villains take over as the events of the “missing time” seen in “Guardians of the Dawn GRADUATION” are revealed through the eyes of The Libra Order! The agents of the Libra Order clear their ledgers of those that did them harm, and their actions will have a lasting impact on the Guardians of the Dawn! 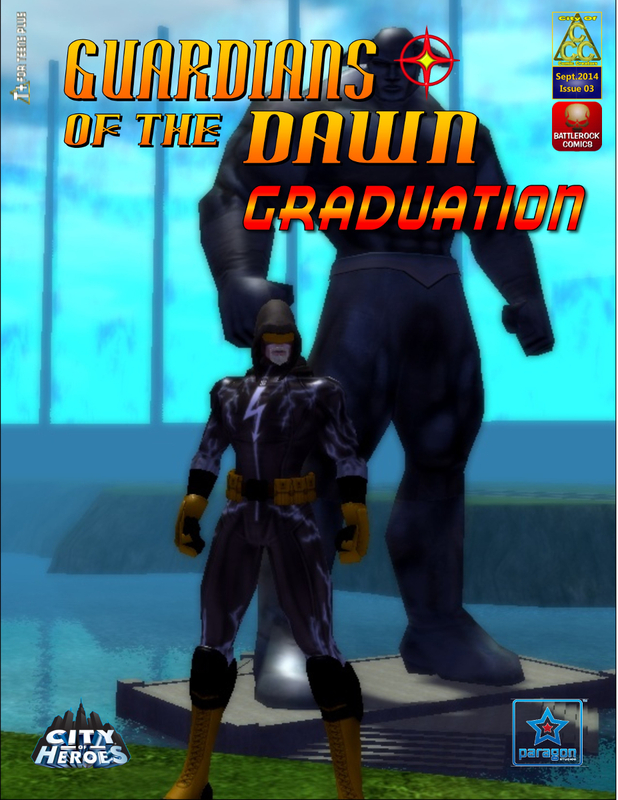 “Guardians of the Dawn GRADUATION” is created using original characters in the City of Heroes Multiplayer Online Roleplaying Game. Copyright © 2004-2012. This story is an independent not-for-profit derivative work of the City of Heroes Game. All original rights are reserved by NCSoft and Paragon Studios. NCSoft, the interlocking NC logo, Paragon Studios, City of Heroes, City of Villains, and all associated logos and designs are trademarks or registered trademarks of NCSoft Corporation and Paragon Studios. Cryptic Studios is a trademark of Cryptic Studios, Inc. All other trademarks are property of their respective owners.